Robyn presented a Country Music program on 2RRR (Ryde Regional Radio) 88.5FM every Sunday morning for 13 years from 8 to 10am. Concentrating on all facets of contemporary country music, the show featured a half-hour special each week on a particular artist ranging from cult performers like Kelly Willis through to mainstream stars like George Strait. Country music legends like Hank Williams, Patsy Cline, George Jones and Merle Haggard were also on a regular playlist as were quality Australian acts like the Dead Ringer Band, Carol Young (now with the Greencards), and the Wheel. With an ear for quality and an easy going rapport with her many loyal listeners Robyn also played requests that ran the gamut of country music styles. During her 13 years on air Robyn welcomed a select bunch of local and overseas artists into the studio, these included Bill and Audrey, Lucinda Williams, Rosie Flores, Bruce Robison, Kelly Willis, Mary Chapin-Carpenter and Dr Hook front man Dennis Locorriere. These days Robyn presents 'Across the Borderline' a country and roots music program, twice a month in her old timeslot and fills in for other presenters when needed. The show features interviews with local and international acts. Nashville singer songwriters Kevin Welch and Kieran Kane as well as Australians Corrina Steel and Bill Chambers are recent interviewees on 'Across the Borderline'. As the theme song of the show suggests you could hear all types of roots music from Cajun & Zydeco to Country blues and soul. 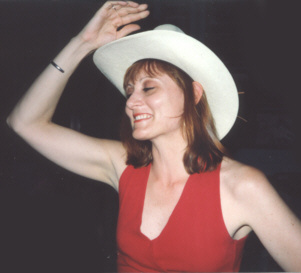 Some of Robyn's personal favourites include, Dwight Yoakam, Shelby Lynne, Steve Riley and the Mamou Playboys, The Flood, Bill Chambers and his daughter Kasey.